آهنی, سمیه, کاکاوند, الهام, زارعی, فاطمه, پورمحمدی, محمدرضا. (1397). بررسی کیفیت محیط شهر الکترونیک با تأکید بر ادراکات ذهنی شهروندان، مورد مطالعاتی: شهر تبریز. معماری و شهرسازی آرمان شهر, 11(23), 283-293. سمیه آهنی; الهام کاکاوند; فاطمه زارعی; محمدرضا پورمحمدی. "بررسی کیفیت محیط شهر الکترونیک با تأکید بر ادراکات ذهنی شهروندان، مورد مطالعاتی: شهر تبریز". معماری و شهرسازی آرمان شهر, 11, 23, 1397, 283-293. آهنی, سمیه, کاکاوند, الهام, زارعی, فاطمه, پورمحمدی, محمدرضا. (1397). 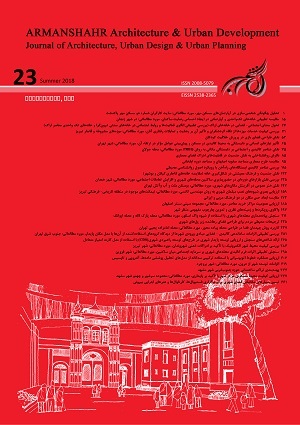 'بررسی کیفیت محیط شهر الکترونیک با تأکید بر ادراکات ذهنی شهروندان، مورد مطالعاتی: شهر تبریز', معماری و شهرسازی آرمان شهر, 11(23), pp. 283-293. آهنی, سمیه, کاکاوند, الهام, زارعی, فاطمه, پورمحمدی, محمدرضا. بررسی کیفیت محیط شهر الکترونیک با تأکید بر ادراکات ذهنی شهروندان، مورد مطالعاتی: شهر تبریز. معماری و شهرسازی آرمان شهر, 1397; 11(23): 283-293. 2کارشناسی‌ارشد برنامه‌ریزی شهری، دانشگاه آزاد اسلامی واحد قزوین، قزوین، ایران و عضو باشگاه پژوهشگران جوان و نخبگان. 3استاد گروه جغرافیا، دانشکده جغرافیا و برنامه‌ریزی شهری، دانشگاه تبریز، تبریز، ایران. فناوری نوین اطلاعات و ارتباطات در حال ورود به اجتماعات انسانی است و بسیار دور از ذهن است که بتوان تنها با اتکاء به شیوه‌های گذشته، طراحی، برنامه‌ریزی و مدیریت شهرها را انجام داد. مهم‌ترین راهکار در این زمینه شهر الکترونیک است که با هدف به‌کارگیری از فناوری‌های نوین در طراحی همه عرصه‌های محیط شهری پا به عرصه جهانی گذاشته است و می‌توان اذعان داشت که تأثیرات حاصل از آن در کیفیت محیط شهری جلوه‌گر می‌شود. در مقاله حاضر با استفاده از روش توصیفی- تحلیلی و با به‌کارگیری نرم‌افزار Spss و آزمون‌ آنالیز واریانس یک‌طرفه (Oneway) در تجزیه و تحلیل داده‌ها، با حجم جامعه آماری 1494998 نفر پرسش‌نامه‌هایی حاوی سؤالاتی جهت دریافت رضایت‌مندی شهروندان از کیفیات محیط شهر الکترونیک در جامعه مورد نظر (شهروندان شهر تبریز)، در نظر گرفته شده است. در این پژوهش رضایت‌مندی شهروندان از محیط شهر الکترونیک به‌عنوان متغیر وابسته و معیارهای محیطی، اجتماعی، اقتصادی و کالبدی به‌عنوان متغیر وابسته معرفی می‌شود. براساس فرمول محاسباتی کوکران و با ضریب خطای 0.06 درصد، به‌طور متوسط 267 عدد پرسش‌نامه در هر منطقه تعیین شده و با استفاده از روش نمونه‌گیری چند مرحله‌ای خوشه‌ای در مناطق ده‌گانه توزیع شد. نتایج حاصل از پژوهش نشان می‌دهد که کیفیت کالبدی محیط شهری متأثر از فناوری ارتباطی و اطلاعاتی با امتیاز 4.20 در حد خوب، کیفیت محیطی و اقتصادی محیط شهری متأثر از فناوری ارتباطی و اطلاعاتی با امتیاز 3.7 در حد متوسط، معیار اجتماعی، با امتیاز 3.4 پایین‌ترین امتیاز را در بین معیارها به خود اختصاص داده است. همچنین کیفیت محیط سکونت متأثر از پیاده‌‌سازی فناوری اطلاعات و ارتباطات در شهر تبریز از دید ساکنین به‌طور کلی در سطح خوب ارزیابی می‌شود. درنهایت مدل مفهومی پیشنهادات در راستای کاربردی کردن نتایج حاصل از تحقیق ارائه شده است. Amid, H. (1984). Amid dictionary. Amir Kabir Institute, Tehran, Iran. Amin Salhi, F. (2008). Improving the Quality of Living Environment in High Rise Complexes and Providing Appropriate Solutions, Case Study Ekbatan. Master’s Degree in Urban Planning, Tarbiat Modarres University, Faculty of Arts and Architecture. Aurigi, A. (1997). Virtual Cities, Social Polarization and the Crisis in Urban Public Space. Journal of Urban Technology, 4. Azmi, M. (2006). Life and Transportation in Smart City, 13. Bahrami nejad, D. (2002). Recognizing and Assessing the Quality of Urban Environment in the Urban Context.University of Shiraz, Faculty of Arts and Architecture. Bailey, A., & Ngwenyama, O. (2011). The Challenge of E-Participation in the Digital City: Exploring Generational Influences among Community Telecentre Users. Telematics and Informatics, 28(3). Carmona, M. (2003). Public Places Urban Spaces: The Dimension of Urban Design. Oxford, Architectural Press. Çukurçayir, M., Eroglu, H. (2010). E-Cities: A Content Analysis of the Web Pages of Heidelberg and Konya Metropolitan Municipalities. Current Research Journal of Social Sciences. Farzin Mehr, R. (2009). Investigating the Influence of Information and Communication Technology on the City’s Physical Structure. Master’s thesis, Islamic Azad University, Qazvin, Faculty of Civil and Architecture. Ghavimi, A. (2010). Electronic Municipality and Urban Optimization Model. Shams Monthly, 66. Golkar, K. (2001). Components of Quality Builder in Urban Design. Soffeh Journal, 32. Graham, S., & Marvin, S. (2016). Telecommunication and the City: Electronic Spaces. Urban Places. London and New York. Ha, M., & Weber, M.J. (2014). Residential Quality and Satisfaction: Toward Developing Residential Quality Indexes. Home Economics Research Journal, 22 (3) . Lansing, J.B., & Marans, R.W. (1969). Evaluation of Neighborhood. Journal of the American Institute of Planners. Lee, S., Jung, H., Yoon, T.L., & Tan, Y. (2008). Towards Ubiquitous City: Concept, Planning, and Experiences in the Republic of Korea. QUT Digital Repository: http://eprints.qut.edu.au/. Mcgaw, J., & Vance, D. (2008). Who Has the Street-smarts: The Role of Emotion in Co-creating the City. Emotion, Space and Society, 1(1). Meer, A., & Winden, V. (2003). E-governance in Cities: A Comparison of Urban Information and Communication Technology Policies. Regional Studies, 37(4). Mitra, A., & Schwartz, R.L. (2001). From Cyber Space to Cybernetic Space: Rethinking the Relationship between Real and Virtual Spaces. Journal of Computer-Mediated Communication, 7(1). Moghtaderi Esfahani, F.(2009). Information and Communication Technology and the New Framework for Urban Design. Quarterly Journal, 15. Motlagh, M,. & Behroznia, P.(2009). The Effect of Information and Communication Technology (ICT) on Urban Development, Case Study of Arak City. Social Sciences Research, 2. Odendaal, N. (2003). Information and Communication Technology and Local Governance: Understanding the Difference between Cities in Developed and Emerging Economies. Computers, Environment and Urban Systems. Pazalos. K, (2011). An Empirical Investigation of the Moderating Effects of BPR and TQM on ICT Business Value. University of the Aegean, Karlovassi, Greece, 215. Porteous, J.D. (1971). Design with People: The Quality of Urban Environments. Environment and Behavior, 3. Rafian, M., & Saifaie, M. (2006). Urban Public Spaces. Review and Qualitative Assessment, Journal of HONAR-HA-YE-ZIBE, 23. Raies dana, S., & Firoz abadi, S.(2006). Technology and the Necessity of its Development. Articles on the Development of Knowledge and Technology in Iran, Tehran. Collection of Research Institute of Humanities and Cultural Studies. Development of Knowledge and Technology in Iran. Reddick, D, (2002). Citizen Interaction with E-government: From the Streets to Servers. Government Information Quarterly. Rutherford, J. (2009). Informational City. International Encyc Lopedia of Human Geography. Sarafrazi, M. (2009). Evaluating New Conceptual E-Readiness in the Establishment of Electronic City and Electronics Municipality. IT management, 49. Sarafrazi, M., & Memarzade, G. (2009). Electronic Ordinary Citizen is a New Indicator in the Establishment of an Electronic City. Information of Technology, 44. Sarmad, Z., & hejazi, A. (2001). Research Methods in Behavioral Sciences. Tehran, Informed Publishing. Singh, A.K., & Sahu, R. (2008). Integrating Internet, Telephones, and Call Centers for Delivering Better Quality E-governance to All Citizens. Government Information Quarterly, 25(3), 477-490. Statistics Center of Iran. (2006). Population and Housing Census. Vaisi, A., & Ghaisvandi, A. (2011). The City of Eternity, The Reality of Tomorrow’s Cities. Analysts of the Information Age, Fifth Edition, Forty-fifth Edition. Van poll, R. (1997). The Perceive Quality of the Urban Residential Environment. A Multi – Attribute Evaluation, Groningen. Wu, Fulong. (2007). Re-orientation of the City Plan: Strategic Planning and Design Competition in China. Geo Forum. Zisa Consulting Engineers. (2006). Tabriz City Council Detailed Plans.